MuriellaI’ve never been on a date. three with the man I secretly long for. would bring everything crashing down around us. irrelevant. Wherever he thinks this may lead, he’s wrong. That’s how long I’ve waited for her. determination, each new revelation seems to pull us apart. against us, we may not even make it to date three, let alone forever. courting. A lot of writing. The result…Grahame Claire. that rooted in our heads and wouldn’t leave us alone. Don’t worry. 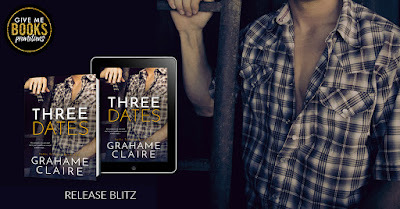 Three Dates by Grahame Claire, the second book in the Paths to Love series and pulled me right in from the start. It was a friends-to-lovers story with all the feels. Stone has wanted Muriella for a long time and he is ready to show her what they can be. But will she ever be able to give him a chance? Muriella’s past was not an easy one. She held back on so much and that included men. Her past was dark, and her demons weighed heavily on her. Stone Jacobs cared deeply for Muriella and wanted to show her what they could be. And was determined to do so. He was so freaking caring and sweet with her. When Stone gets three dates to show Muriella what they can be together, he is determined to do so and pulls out all the stops. He was so patient and understanding with her. It allowed Muriella to slowly open up to him. Three Dates by Grahame Claire was a sweet slow-burn story with great characters!